When we’re determining which technology will best serve your brand, we like to begin with a question: Do you want to alter your reality or be transported to an entirely new one? For instance, 360° Video headsets shut out our surrounding environment and transport us to locations that were shot in 360 degree video. Unlike yesterday’s videos, which only allowed us to look where the camera looks, this technology puts the user in control, allowing consumers to look into the eyes of the people on camera or turn around to see what they see. But in 360° Video you can only pivot around a fixed position. Virtual Reality, which also shuts out the present environment and transports us elsewhere, goes a step further: it allows us to create computer-generated fictional worlds and interact with them as though they were real. Go for a stroll. Spill coffee. Slay monsters. The better the technology, the deeper and more realistic the immersion. 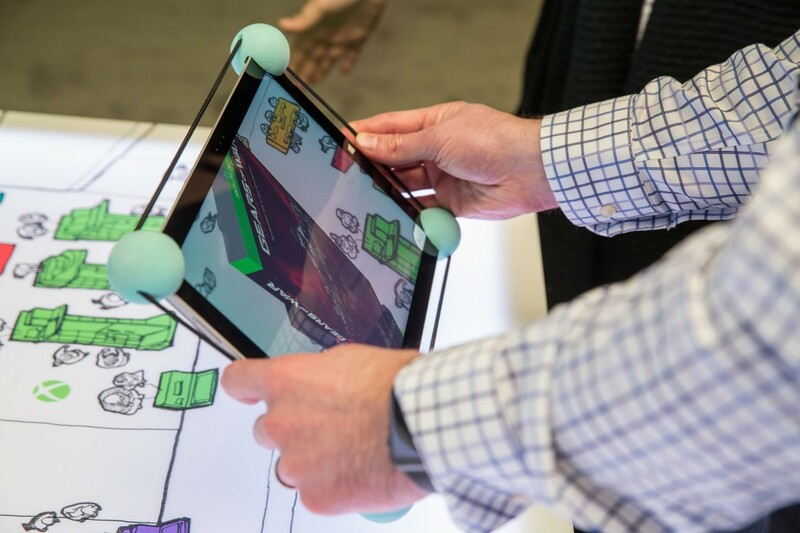 We utilized Augmented Reality technology during Microsoft’s CES 2016 activation to enable customers to virtually go in store and view merchandising solutions. Unlike 360° Video and Virtual Reality tech, Augmented Reality devices don’t shut out the real world — they alter it. AR generates two and three-dimensional graphics and overlays them across your physical environment, as though you were looking through a graffitied window. Augmented Reality devices — which could utilize LED screens, mobile phones, or hi-tech glasses — might make your text messages seem to hover above your kitchen counter or they might reveal a zombie who’s also chilling at your bus stop. Mixed Reality is like Augmented Reality 2.0. The visuals created by Mixed Reality devices blend more organically into the real world by creating spatially aware holograms that can intelligently interact with the objects around you. A little elephant can walk on your desk, robots can blast holes in the wall behind you, and everything can be interacted with using gestures, creating an even deeper sense of magic. It’s worth noting that Mixed Reality is the emerging technology of the alternate realities. At the moment, there’s only one device on the market — Microsoft’s HoloLens — and it’s only available to developers. Luckily, we happen to know said developers. Wait, so which one is the best for my brand? Well, to begin with, it’s important to remember that you can’t go wrong. Because alternate-reality devices are still cost-prohibitive for most consumers, consumers are thrilled to interact them. And, for many of them, this will be their first exposure to these gadgets. Still, different circumstances call for different technologies. To return to our springboard question: it’s all about whether your brand will do better by enhancing the consumer’s reality or by changing it altogether. Brands that promise to enhance the daily lives of consumers might do better with Augmented or Mixed Realities, which elevate mundane experiences. For instance, a clothing brand might use AR to show consumers how new outfits would look on them or a Hollywood studio might elevate the traditional movie poster by merging a fictional world with our real one. On the other hand, brands that promise to dramatically change consumers’ circumstances might go further with Virtual Reality and 360° Video. A travel brand can tease consumers with 360° Video of an exotic destination and video games fare especially well in Virtually Reality. Because AR experiences simply layer onto the real world, consumer interactions tend to move more quickly and require a smaller footprint. By contrast, consumers who enter into a Virtual Reality world often need more time to get equipped and become situated in the environment. Because of the extra time, your footprint may have to account for consumers waiting in line. Not to worry though, because lines look great in activation stills and sizzle reels, and they can attract the attention of additional consumers. If consumers need to interact with a real-world product or if the brand wants to capitalize on the activation’s real-world location, Augmented Reality will work best. For identical experiences across multiple locations, 360° Video and Virtual Reality allow brands a more tactical option. In this 360° Video activation, consumers could visit Australia from any activation location. 360° Video must be filmed on location, whereas VR, AR, and MR involve programmers and designers crafting the visuals with ones and zeroes. Some Augmented Reality experiences require static objects or images in the real world to trigger the alternate-reality event. We can fabricate these objects or select an activation location to act as the trigger. 360° Videos can live online after an event. Users can watch them on YouTube or a brand’s website and even adjust the camera view for the full 360° experience, just as if they had been there on activation day. By contrast, for any of the other technologies, we’d capture video of consumer interactions on the day of the event. For instance, consumers could share video of their personal walkthrough of the Virtual Reality space. Whatever the tech you use, we always ensure that it’s socially shareable, so that your activation continues returning dividends even after you’ve paid the bill. Uh… I thought this article was supposed to make things simpler…? True simplicity comes with the mastery of complexity. We’ve only scratched the surface here for each technology’s radically different budget, timeline, and feasibility considerations. But you shouldn’t be worrying about all that anyway. That’s why we didn’t even bother talking about motion tracking, haptic feedback, or the virtuality continuum. We have experts in all that so that you don’t have to be one. If you’re looking for guidance on how best to harness the power of alternate-realities to enhance prestige, amplify awareness, and drive sales, then all you have to do is ask. The michael alan group is a full-service experiential marketing agency & event production company. Check out our work and our team, and drop us a line to explore implementing experiential tech into your next activation.